You are currently browsing the tag archive for the ‘golf’ tag. Friday Schmiday. Give me the weekend. Yes, indeed it is. Finally. This week was long, and it felt like there was an extra day in there–especially when I thought Thursday was Wednesday… but luckily it’s here now and we can rest for a few days. 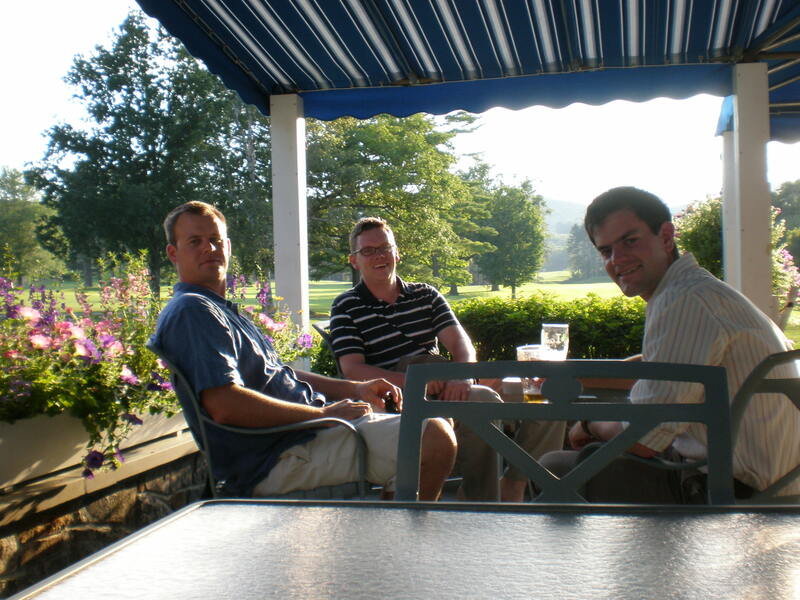 Mark’s up in Williamstown golfing in an Alumni Tournament, schmoozin with some buddies and enjoying the fresh air in the purplest of mountains ever to be. I hope he comes home with good stories of amazing shots and perfect putts, and brings me back a prize. Maybe a funny hat or one of those little pencils? I’ll let Mark describe more on what I’m sure will turn out to be a fabulous golf weekend when he gets back. For me, I’m running… and swimming and biking… my triathlon in Webster Mass this weekend!! My friend and colleague Molly and I are heading down tomorrow to the Expo, then back up here for some carbo-loading, then back down in the early a.m. to rack our bikes and head to the water for a 7:00 start. Some of our friends from the office have promised to make the trek down and cheer us on, so we’re super excited for that, and appreciative too–since none of our family members will be able to be there sadly, it will be great to have friends there to shout out “Go Molly! Woohooo! Yay Anna! Don’t die! !” and other such things as we speed by them on our bikes and in our tennies. Here’s a picture from last year’s tri–this was my heat. We go off in heats of similarly-aged women, about 50-80 people, and then they let you go and you’re on your own from there for a .5 mile swim. Then it’s to the bike, 12 miles, and then on to the 2.8 mile run. And then it’s over, and you cheer and cry and drink lots of water, and then you eat a giant meal and go to bed because that’s all you want to do you’re so hungry and tired. I’ll put more pictures up of the weekend in a later post. Wish us luck!! What’s everyone else up to this weekend?